This Task will foster the integration of daylight and electric lighting solutions to the benefits of higher user satisfaction and at the same time energy savings. 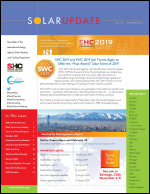 The Solar Heating and Cooling Technology Collaboration Programme (SHC TCP) was established in 1977, one of the first programmes of the International Energy Agency, to promote the use of all aspects of solar thermal energy. The SHC TCP's work is unique in that it is accomplished through the international collaborative effort of experts from member countries and the European Union. Conference Registration to Open Soon! 2nd Expert Meeting of IEA SHC Task 62 in Almería - The 2nd expert meeting of our IEA SHC Task 62 took place from 2nd to 3rd of April in Almería, Spain. Almost 30 experts from all over Europe jonit the meeting that took place at CIEMTA PSA. IEA SHC Task 62 presented at 84th ExCo Meeting in Lisbon - On November 13-15, the 84th ExCo Meeting was held at LNEG in Lisbon, Portugal. Christoph Brunner, Operating Agent of Task 62, presented the ongoing activities within the Task. Future Meetings & Events - Check here for a list of upcoming Task Meetings & Other events yet to be scheduled. Final Experts Meeting 19-20 Sep 2018 - We're looking forward to our final experts meeting from 19-20 Sep 2018 in Oslo, Norway. More info will be provided on our events section soon.